Eliminate your problems while moving the Poblano pepper by using this beautiful “OXO Tongs". 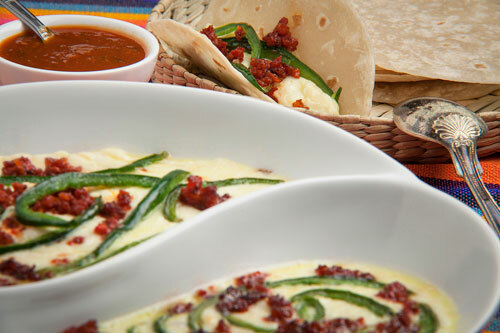 The “Old el Paso Flour Tortillas" will go perfect with your melted cheese for its flavor, size and softness. Use a cute and colorfull tortilla container so your tortillas remain warm and soft. This melted cheese variation combines the spicy and intense flavor of the peppers with the condimented flavor of the chorizo – and all these flavors are wrapped in the soft and fresh flavor of the cheese. Really delicious! This dish is an excellent entree plate because the hotness of this appetizer whets the appetite. It can also be served as main course because it is highly nutritious and very complete . – In Mexico the melted cheese is always served with flour tortillas and it is eaten rolled as a taco or folded in half as a quesadilla. To make this melted cheese the only laborious part are the peppers... from there on everything is easy. It is very important to use some cheese that melts. We recommend the Chihuahua cheese or the Asadero cheese. Prepare your own flour tortillas to enjoy them with the melted cheese. Although maize tortillas could also be used. Preparation time 25 minutes . The recipe is for 6 cheese tacos. Cut 3.5 oz of chorizo into small chunks, then reserve. Heat in a frying pan over medium-high heat 1/2 tablespoon of olive oil. The Poblano Pepper strips that were cut. The Chorizo small chunks that were cut. Mix the frying pan ingredients and fry them for about 4 minutes, until the chorizo is moderately cooked; stir regularly. Then set aside. Transfer from the frying pan to the baking dish the peppers and the chorizo that were cooked. * If possible serve this dish in a small clay cazuela , it will look beautiful. Suggestion: Choose the salsa that you like the most to accompany this lovely dish. Variation: The melted cheese can also be prepared with mushrooms.